A legacy is more than a financial inheritance that you leave for the important people in your life. It is about the essence of who you are that extends into the future—the good that you leave behind. Phil Griffin, a leader at YMCA Camp Ihduhapi for many decades, has left a gift to the YMCA in his will as a legacy to further the work of the YMCA and Camp Ihduhapi for generations. Phil has enjoyed the Y his whole life—his parents were engaged at Camp Ihduhapi, he spent time at the St. Paul Midway Y playing in the gym and learning to swim and was a Y camper and camp counselor, learning to canoe, building leadership skills and building friendships. 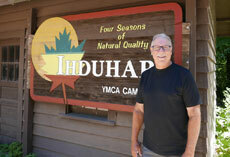 Phil became the youngest member of the Camp Ihduhapi Community Board and went on to serve for 25 years. “I believe in the philosophy of the YMCA. You leave a campsite cleaner than you found it. You leave wood in the campfire ring for the next person. This has become my philosophy for life, and the philosophy that has led me to leave gifts in my estate plan for YMCA Camp Ihduhapi, Hamline University and my church—organizations that have deeply influenced and shaped me,” Phil said. Thank you to Phil and the many friends and members of the YMCA who have included YMCA branches and camps in their estate plans. Their vision and generosity will advance the YMCA mission and support the YMCA's work in the community long into the future. When creating a planned gift, you designate the purpose and use of your gift in writing to provide guidance to those who will be managing your gift in the years ahead. Designate the gift to the YMCA of the Greater Twin Cities, 651 Nicollet Mall Ste. 500, Minneapolis, MN 55402 (Federal Tax ID 45-2563299). Specify the YMCA branch or camp toward which you are directing your planned gift. The YMCA of the Greater Twin Cities is a 501(c)3 nonprofit organization and serves as the legal entity for all YMCA branches and camps. Please contact YMCA Senior Director of Planned Giving, Jeri Glick-Anderson, at 651-435-6724 or plannedgiving@ymcamn.org for more information and assistance.